SIX community groups in south Wiltshire and West Hampshire have been given funding by Scottish and Southern Electricity Networks (SSEN) to help during emergency situations such as winter storms and flooding. BULFORD Parish Council will receive £14,626 to purchase flood equipment, while Hampshire Search and Rescue (HANTSAR) gets £13,375 to purchase handheld GPS equipment. Wessex 4x4 Rescue will be given £18,500 to purchase a trailer, Team Rubicon UK £7,000.00 to boost volunteer recruitment and Wessex Flood Rescue Unit £15,365 for training and equipment. Finally, CHILMARK Parish Council will receive £2,659 to purchase two mobile generators. In addition to its Resilient Communities Fund, SSEN has been working with communities to create resilience plans for emergencies, such as adverse weather and possible power disruptions during winter storms. SINCE disastrous flooding four years ago, GODALMING Town Council in Surrey has worked closely with the Environment Agency, the county and borough councils, utility companies, Godalming Flood Group and the Farncombe and District Allotment Association on the Godalming Flood Alleviation Scheme. 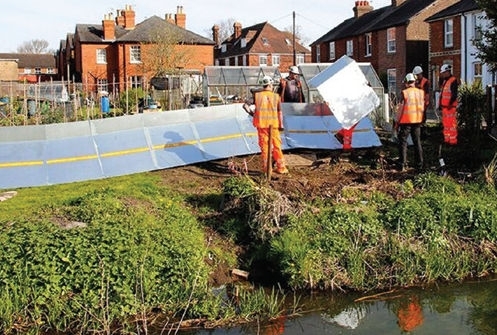 The latest step was the test deployment on 5 April of temporary flood defence barriers along Hell Ditch, to protect Meadrow and Catteshall roads. The council is donating most of the land needed for permanent defences to be built and will also maintain the defences once constructed. However, construction is not due to commence until spring 2018 and protection is needed in the meantime. Groundwork was undertaken during the autumn of 2016 to provide a cleared zone for the temporary defences. RINGWOOD Town Council held its second open air full council meeting on 27 July, and now plans to make this an annual event. Around 70 people attended, including a good number of young people. Topics discussed included plans to build 1,200 new homes in the Hampshire town, with Cllr Edward Heron of New Forest District Council fielding questions about the consultation process. Meanwhile the council has secured £4,000 of funding from Scottish and Southern Electric’s Resilient Communities Fund to support residents vulnerable to flooding and loss of power. The money will provide six small generators to keep essential items working such as fridges, heating and TV and radio, and also a supply of self-inflating sandbags to deal with immediate issues of flooding. Cllr Andrew Briers, chairman of the Recreation and Open Spaces Committee, said: “Partnership funding is essential in delivering services without placing additional financial burdens on existing budgets.” The council has already freed up over £50,000 of Section 106 funding in the past 18 months to help reduce flooding. ABACUS Playgrounds has launched SUDS-bond (Sustainable Urban Drainage Solutions), a unique paving solution that promises to actively prevent flooding in urban areas, improving drainage and removing the need for planning permission. SUDS-bond’s fully porous surface is ideal for areas suffering from poor drainage and high rainfall levels and can be installed on playgrounds and along cycle paths, walkways, tree surrounds and equestrian trails, massively reducing water run-off. 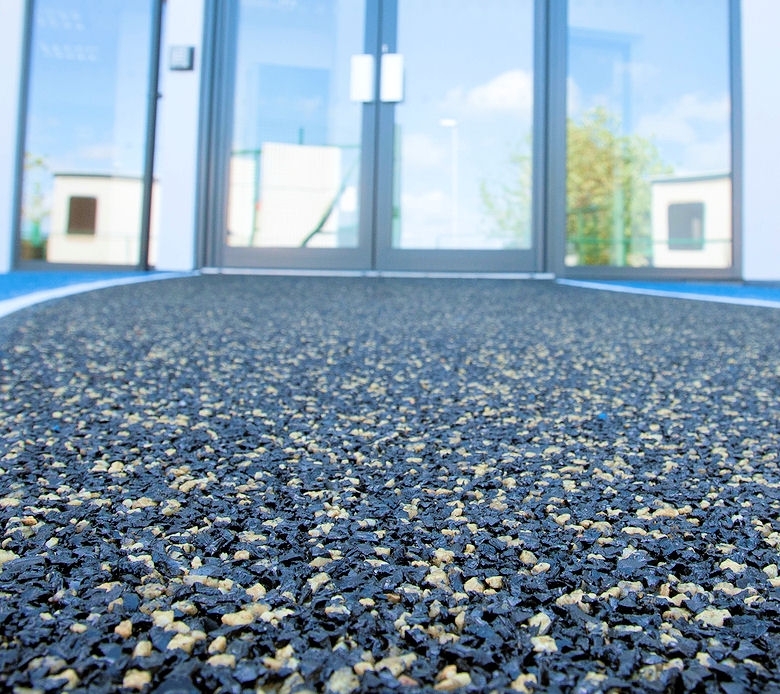 The robust black rubber and coloured aggregate surface is combined with a polyurethane binder to create a continuous surface with excellent grip and enduring toughness, according to the company. It is very low maintenance, does not always require a newly engineered base and is easy to install. The unbroken surface is wheelchair- and bike-friendly and can completely eliminate the need for planning permission. Available in three core colours – red, yellow and silver – it is suitable for virtually any application. For more information, visit www.abacuspg.co.uk. SEAFORD & NEWHAVEN Town Councils jointly organised the Seahaven Community Flood Fair on 23 April, in partnership with East Sussex County Council and Lewes District Council. The event provided residents with information and practical advice on how to protect themselves and their properties, and with help from the Environment Agency and the National Flood Forum. WORKINGTON Town Council donated £5,000 to the Cumbria Flood Appeal at a meeting on 16 December, and promised a further £5,000 three months later if it was still required. Councillors considered a number of options but decided that a straightforward donation would provide the quickest response. The town’s mayor is also planning a charity concert to raise money for the appeal. In Workington itself, council staff helped with the clear-up; the town’s riverbanks may require remedial work in the spring. 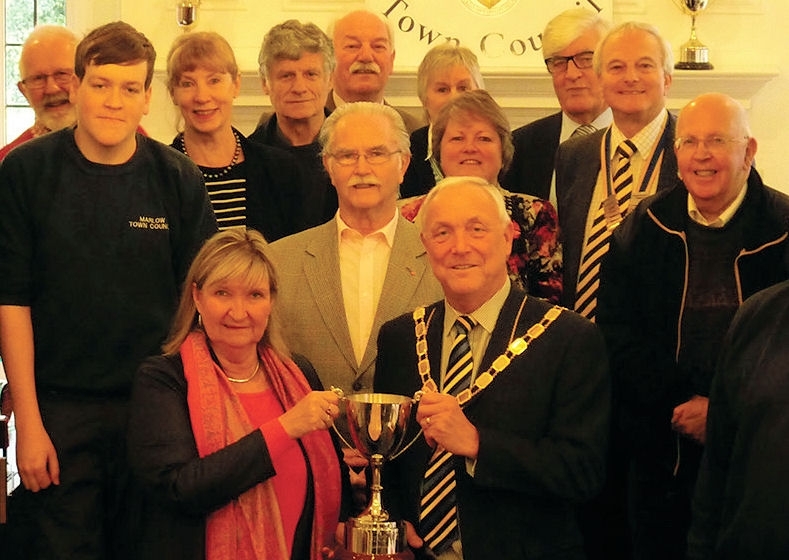 ANNIE Jones, clerk to MARLOW Town Council in Buckinghamshire, recently won the Society of Local Council Clerks (SLCC Bucks) Clerk of the Year Award. This is presented to an individual who has displayed leadership, initiative, creativity and exceptional support to their town or community. The mayor, Cllr Bob Johnson, nominated Annie for the award, praising her initiative, resilience and communication skills, and presented it to her on 14 December, in the presence of councillors, officers and members of the community. Annie has since been instrumental in producing a Local Flood Plan to ensure that the council can respond effectively to any future flood issues. AN estimated 20,000–25,000 people attended the Taste Cumbria Christmas Market in COCKERMOUTH in mid-December, just a week after the Cumbrian town was deluged by floodwater. The event became a focal point for the town’s recovery, with organisers determined it would go ahead. Many of those attending had themselves been badly affected. Allerdale Borough Council, Cockermouth Town Council and Cockermouth and District Chamber of Trade were among organisations supporting the event. Cllr Margaret Lenton, Wraysbury Parish Council chairman, said: “We received a lot of nominations but we decided it should go to the flood team given all the work they had to do.” Nominees and winners were presented with a paperweight and Mr Sinclair also received a clock for long service. His views were echoed by residents while Cotswold MP Geoffrey Clifton-Brown, chairing the meeting, reported that people in other areas had also raised concerns. The meeting was attended by officials from Thames Water, along with members of Cirencester Town Council and Gloucestershire County Council. County councillor Shaun Parsons raised the proposed development of around 2,500 homes in Cirencester and said that the town’s current infrastructure would “struggle to cope” under the weight. Mr Clifton-Brown also expressed concerns, but said that he was “not satisfied” that Cotswold District Council (CDC)’s planning committee had sufficient powers to reject developments on flooding grounds. The MP has brought the issue up in Parliament, and is to meet planning minister Nick Boles MP at CDC’s offices to discuss it. He has also held flood meetings elsewhere in the district, including at South Cerney, Fairford and Moreton-in-Marsh. AFTER one of the wettest winters on record, play areas and playing fields are coming out of their winter “break” and, with spring on our doorstep, can once again be enjoyed by children. It is important that councils undertake good checks for any damage caused to equipment and surfaces. In particular, where there has been flooding, rubberised play area surfaces may have had their sub-base washed away and/or their loose-fill surfaces floated off. Excessive rain and a relatively mild winter may also have caused algae build-up on surfaces, making them slippery (if this is the case, pressure washing usually works). Make sure that you have booked your annual RoSPA play area inspection – not only to protect children in your community, but also to protect against litigation in the event of an accident. To book an inspection, contact info@rospaplaysafety.co.uk. Now is also the time to repair worn ground areas on playgrounds and playing fields. A cheap and effective way of doing this is to cut a piece of turf from the edge of the field and lay this to repair the worn area. You can then seed the area from which you have taken the turf; this method results in a quicker repair than seeding the worn areas themselves. If you have a local handyman or volunteer who carries out routine inspections and maintenance, consider sending them on the relevant RoSPA course. Contact Alyson Pugh on apugh@rospaplaysafety.co.uk for details. NEARLY 200 people attended a service outside Canvey Island Library on 1 February to commemorate the 60th anniversary of the 1953 floods that hit the east coast of the UK. The town council marked the anniversary, in partnership with Essex County Council, by unveiling a plaque and holding a short service, together with an exhibition of photographs, press cuttings and other items. Guests included survivors and those who provided rescue services, some of whom had travelled from as far afi eld as France, the Netherlands and Cornwall. The new plaque, made of black granite, was funded by Canvey Island Town Council and was installed beside the existing flood memorial plaque. The 1953 flood was one of Britain’s worst peacetime disasters, and Canvey Island was one of the worst affected areas. In the early hours of 1 February 1953, 58 islanders lost their lives and 11,000 residents were evacuated to rest centres on the mainland. VILLAGERS in Burton, Dorset took advantage of a respite from snow and flooding to carry out an early spring clean. Ten residents targeted ditches and hedges and filled 18 bin bags in the space of two hours. Colin Jamieson, county and borough councillor for Burton, said that recent flooding had shown the importance of keeping ditches free from rubbish, which can block drains. FOLLOWING serious flooding in November, Malmesbury is to create a major incident plan. The town council has asked former Metropolitan Police chief Phil Selwood, who lives in the area and who worked on the aftermath of the 7/7 London bombings, to lead a group to create an emergency response scheme that will help residents deal with anything from extreme weather and natural disasters to plane crashes. The mayor, Cllr Ray Sanderson, told a special meeting that one of the town’s main employers had offered to provide funding to deal with floods, and the council has set aside £5,000 to deal with future emergencies at the request of Cllr Simon Killane. Cllr Killane said that many residents were not on the Environment Authority’s risk register and did not receive automated warning phone calls. the stability of the historic Henrietta Street, after landslips carried down earth and human bones from a churchyard. Another landslip on the East Cliff meant that a terrace of five houses had to be demolished. Council leaders were angry that no-one seemed to be taking charge of the crisis, and also that no-one from Scarborough Borough Council turned up to the meeting. Mayor John Freeman said: “I think Scarborough Council will be embarrassed there is no-one here for such an important meeting, and the excuses for not coming are fairly lame. THE problem of water filling graves at a cemetery in Arlesey has become so bad that the facility may be forced to close. At one recent funeral, a man’s body had to be taken back to the mortuary as the grave was completely flooded. Cllr Nick Daniels, chairman of the town council, said: “The decision might be made to close the cemetery. It has been an ongoing problem for many years since it was located there. In the past we have always had the water pumped out a few days before they are laid to rest. However, we have had so much heavy rain recently that it was not possible to get it out in time.